The Sindh High Court (SHC) on Tuesday granted a 10-day protective bail to Pakistan People’s Party (PPP) supremo Asif Ali Zardari and his sister Faryal Talpur but rejected their request to issue a stay order against the banking court’s decision allowing the National Accountability Bureau (NAB) to transfer the fake bank accounts case from Karachi to Rawalpindi, a private TV channel reported. 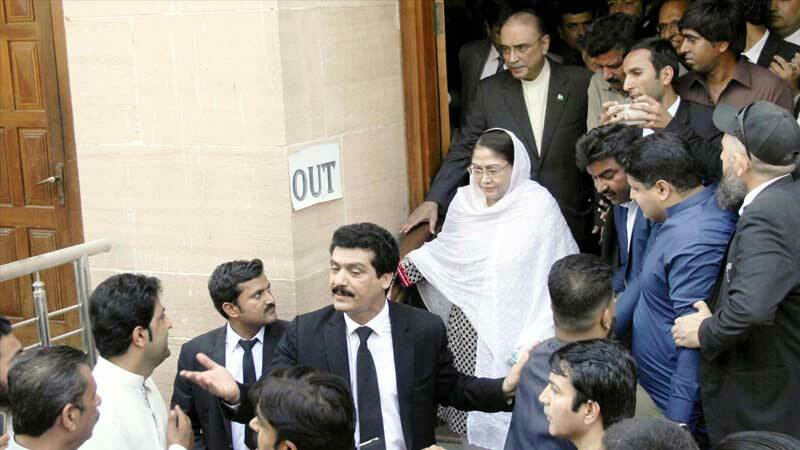 A two-member bench comprising SHC Chief Justice Ahmed Ali Sheikh and Justice Umar Sial heard the petition filed by Zardari and Faryal challenging the banking court’s ruling allowing NAB to transfer the fake accounts case to an accountability court in Rawalpindi. Both Zardari and Talpur have been ordered to submit Rs 1 million surety bonds. Zardari’s counsel, Farooq H Naek, maintained that the transfer of the case contradicted a Supreme Court verdict passed in January this year. NAB has ‘misinterpreted’ the apex court’s decision in the fake accounts case, Naek argued, pointing out that the top court had not ordered that the case be transferred to Rawalpindi. The NAB chairman had submitted the transfer request in the banking court after the Supreme Court wrapped up the fake accounts case, the former president’s counsel told the bench. Turning down Zardari’s request to issue a stay order against the banking court’s ruling, the SHC bench issued notices to the NAB prosecutor and director general of NAB Karachi summoning a response from them within a week. The court further said a decision on the matter will be taken after listening to all the parties in the case. The bench also dismissed Naek’s request to summon the entire record of the case, and adjourned the hearing till March 26. The SHC also granted Zardari a 10-day protective bail in the Park Lane Estate Company case after hearing a petition by the former president who said that he feared arrest by the NAB. The high court heard Zardari’s petition challenging NAB summons in an investigation pertaining to the Park Lane Estate Company. NAB had initiated an inquiry against the father-son duo in pursuance of allegations that Park Lane Estate Company (Pvt) Ltd – a Karachi-based real estate firm co-owned by Zardari and Bilawal – along with government officials were behind the illegal transfer of forest land to the firm. The former president, in his appeal, argued that NAB could not interfere in the dealings of two private companies and urged the court to nullify the call up notice by the anti-corruption bureau. Zardari also requested the court to grant him protective bail. Meanwhile, PPP Chairman Bilawal Bhutto Zardari has decided to appear before the NAB for questioning in the Park Lane Estate case. Sources said the PPP chairman will appear before the watchdog along with his team of lawyers and senior party leaders. On the other hand, a consultative meeting of the PPP leaders has also been summoned at the Zardari House in Karachi to discuss the prevailing situation.